Depending on the weather, an awning stains faster or more slowly. For this reason you should clean the awning fabric and frame at least once a year. This is the only way to ensure that the awning retains its protective and visual properties. 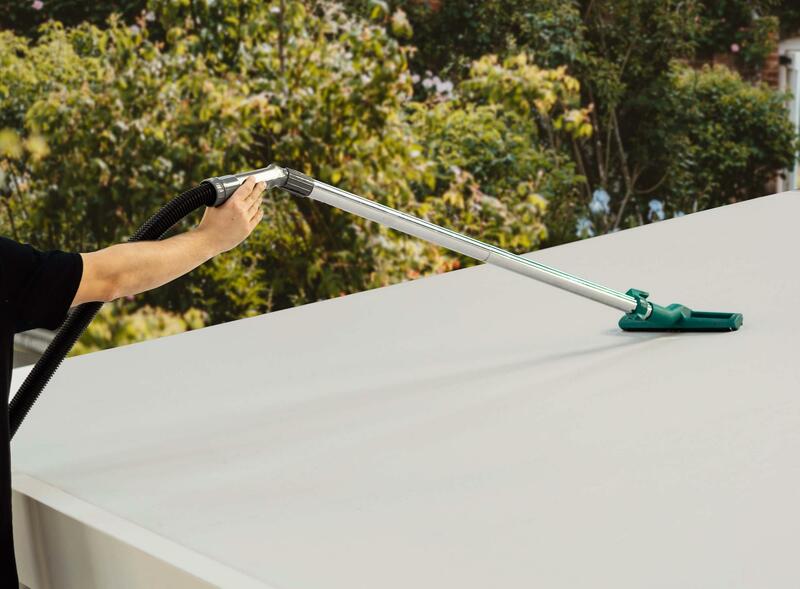 We recommend that you clean your awning using STOBAG's spring cleaning tips so that you are perfectly prepared for the balcony or garden season. But how do you proceed if the awning is soiled? What should you do if you want to clean the fabric? Bird droppings, mildew stains and other unattractive traces should be eliminated promptly. Dirt does not only accumulate on the top of the fabric, but also on the frame. You do not need any aggressive chemicals to clean the various components. You can simply sweep or vacuum off the dry dirt. This also works if to clean the awning fabric. This procedure can be carried out intermittently to remove loose dirt particles. This keeps the operating elements and the basic frame clean, which considerably improves functionality. On the awning fabric itself, mold and dirt stains are more likely to occur if dry-cleaned regularly. If the awning becomes dirty and the stains become damp, moss will soon accumulate on it. After dry brushing, the awning is thoroughly damp cleaned. This is done with a soft scrubbing brush. With a ladder and telescopic handle, you can easily access all the components. A water jet from your garden hose helps against heavy dirt. However, you should never hold the fabric under high pressure when cleaning, in order to avoid damage. A gentle mixture of mild detergent and lukewarm water (max. 40° C) is suitable for damp cleaning with a soft sponge. Work this solution into the fabric until the foam breaks down the dirt. Then rinse the sunshade with clear water to remove the soap residue. 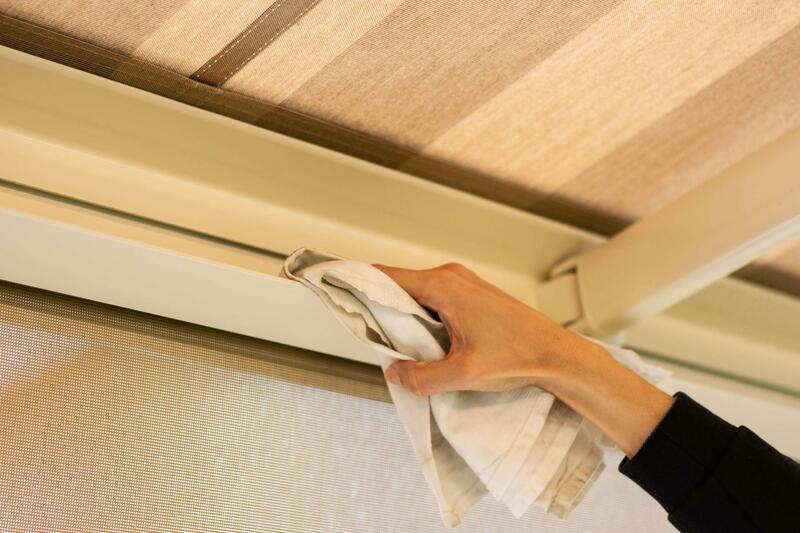 This gentle and delicate method allows you to clean the awning fabric without leaving any traces of dirt or discoloration. Do not use harsh chemicals so that the waterproofing of the fabric is not damaged. After damp cleaning, it is important that the clean fabric dries completely. Only then should the awning be retracted again. Long-lasting moisture damages the fabric. If it is retracted while still damp, the fabric cannot dry off and water stains will cause discoloration. Moisture also promotes the development of mildew. Depending on how dirty the sunshade is, our STOBAG experts will give you a few special tips, such as how to clean small stains or more difficult mold and mildew. Small stains can be removed with a colorless eraser and the stain easily erased. Pollen and other loose particles can be removed with a carpet beater or carefully with a vacuum cleaner. Vinegar water is useful when fighting mold and mildew stains. You can clean the fabric yourself using these tips or you can contact a STOBAG specialist partner depending on the degree of contamination and the amount of work involved. Dirty awning - What is important to keep in mind? If you own an awning, you often have to do with bird droppings. This does not only look ugly, but it can also have a corrosive effect and discolor the fabric. You should therefore remove the excrement as quickly as possible and clean the awning fabric. As long as the droppings are still fresh, they can easily be wiped off with a damp cloth. Already dried excrement can be gently scraped off and then carefully brushed out with a soft, dry brush. Excessive rubbing could damage the fabric. A treatment with vinegar, talcum soap or mild detergent may also be beneficial. Do not use abrasive brushes, even in the case of heavy soiling and stubborn stains. These can destroy the fabric during cleaning. If the awning is dirty, it is important to proceed carefully. If you clean the awning fabric as recommended by the experts, the material will remain beautiful for a long time and will not suffer too much wear. If the awning is dirty, do not wash the fabric in the washing machine. A pressure washer is also not suitable for cleaning the awning. In both cases the hot water strains the specially treated awning fabric. Treatment with high pressure puts a particularly heavy strain on the material. In general, our quality awnings are equipped with an exclusive waterproofing by the fabric manufacturer. This makes the fabric easier to clean because the protective layer prevents stubborn dirt from adhering. However, the waterproofing layer can lose its protective properties after five to ten years. You have the option of taking care of this yourself or contacting a specialist dealer via STOBAG for a replacement fabric. This restores the weather protection and waterproofing against grease and dirt. Use our STOBAG partner search to find out more about our offers for fabric changes and other useful services. In case of excessive contamination or if you would like to exchange a fabric, you can find the right contact here.